It’s a loaded statement to claim apostles still exist today. That’s what I claimed in my most recent post. But the very unique thing is that my first argument is not simply quoting 2 or 3 verses as proof, and dealing with a few verses from those who believe such a ministry would not exist today. In all, the claim that apostolic ministry continues today, I believe, should be based in Jesus – who he is, what his ministry was about. Jesus, himself, functioned in all five of the ministries spoken of in Eph 4:11. 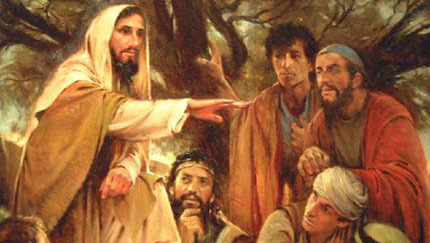 Meaning he was the great apostle, prophet, evangelist, shepherd and teacher. The Holy Spirit came in Christ’s stead to continue the exact same ministry of Christ. And, so, the Holy Spirit is the apostolic, prophetic, evangelistic, shepherding and teaching Spirit of Christ. The whole body of Christ, indwelt and empowered by the Spirit of Christ, is now called to be the whole Christ in the whole earth. That means we are an apostolic, prophetic, evangelistic, shepherding and teaching people. Not everyone individually carries these 5 ministries. But it’s the whole community functioning holistically in these five areas of God’s grace gifting. Therefore, Christ’s desire is to continue to gift individuals in such ministry roles to help equip the body to function wholly in these areas. This, I believe, is the bigger picture. Here we see the writer simply identifying Jesus as an apostle. But, for many, this passage will not necessarily mean much. It might simply point out that Jesus had some ‘office’ or ‘position’ as apostle. But what we really want to know is what practically made Jesus an apostle? He did not just walk around with a business card with the title, ‘apostle’, written on it. So what is an apostle? The word apostle (Greek apostolos) simply means ‘sent one’. Though we all have many conceptions of what an apostle is, in its essence, the word simply means ‘sent one’. And the verb for sent, in the Greek, is apostellō (of course, noting there are derivatives of this word as well). Yet, what is also interesting to note is that the Greek word, apostolos, and the Latin word, missum (where we get our word missionary), mean exactly the same thing. They both mean ‘sent one’. In a most simple understanding, apostle = missionary and missionary = apostle. Now, that doesn’t mean every missionary in the world functions in an apostolic ministry. Of course not! Still, in their essence, the two words are synonymous. Therefore, knowing what the word apostle means (‘sent one’), we can definitely concur that Jesus was an apostle. Remember? He was sent by the Father with a specific mission to accomplish. We don’t really need to quote Scripture to show this, but let’s consider a few passages. Again, I cannot emphasise enough that Paul, or Peter and John, were not the greatest apostles to ever live. That’s one mistake we regularly make. Jesus, and Jesus alone, was the great apostle, for he completely fulfilled the mission for which he was sent by the Father. Now, I recently had an online conversation with a cessationist, one who argues that certain gifts of God (i.e., the ‘sign gifts’) ceased as the first century came to a close. What was argued was something like this: The word used to describe Jesus’ sending was different than what was used for the first apostles. Something of this nature. And, you know, there is also another Greek word referring to being ‘sent’. It’s the word pempsas. This word is used regularly to refer to Christ being sent by the Father (i.e., John 5:37; 6:44; 7:28; etc). However, I just pointed to 4 passages from the gospels that utilise the same Greek word root as with the apostles. Not to mention that Jesus is actually called an apostle in Heb 3:1, using the Greek apostolon. Therefore, it must be duly noted that an apostle, any apostle, is only able to function as an apostle because Jesus was the first and greatest apostle sent by the Father. This will have important ramifications later on as we consider the ministry of an apostle. Jesus was sent. The Spirit was sent. The body of Christ has been sent. Apostles themselves are sent. We need this ministry of Christ today! Normally, apostolos is the word for apostle. But the word apostolon is used twice in the New Testament, once with the definite in mind (the apostle – Jesus in Heb 3:1) and once with the possessive in mind (your apostle/apostle of you – Epaphroditus in Phil 2:25). The plural would be apostolous. For example, see Matt 10:16 where Jesus sends out the 12 and Acts 26:17 where Paul recounts to King Agrippa his encounter with Christ. This entry was posted in apostles, Ephesians 4 ministries, Jesus and tagged apostles, Ephesians 4 ministries, Jesus. Bookmark the permalink.